Is that great news or WHAT? Look at all the boys and their cats. 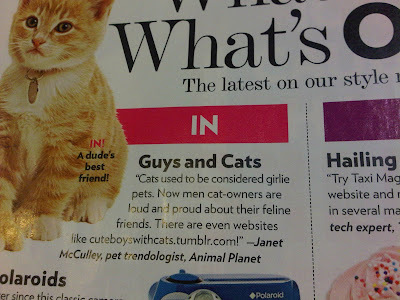 I hope this trend sticks around long enough for me to track down one of these cat-loving dudes. Call me! Gee, and all these years I've just been known as the weird cat guy in the neighborhood. cats are awesome! have you MET funky?!? bahaha now Wes can finally admit his affection for Peepers in public! Wes??? Do you have anything to say? My brother-in-law had a cat during his bachelor days. Cats rule. Why are they all hipsters? Are cats the new skinny jeans?